1 John shows us the basics of living for Jesus in the world. The Christian is called to remain in God, believing in the name of Jesus Christ, loving fellow Christians, and living by the Spirit whom God has given us. 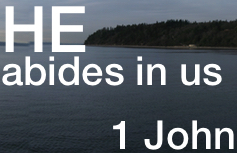 How do we as a Gospel believing church live this out together in Seattle in 2015 for the glory and fame of Jesus?